Two dresses, two patterns, right? Well there were two patterns, but I combined them to make a one new bodice, then made two dresses with that same bodice. It was the lower bodice from Vogue 8766 combined with the neckline from Vogue 8849. 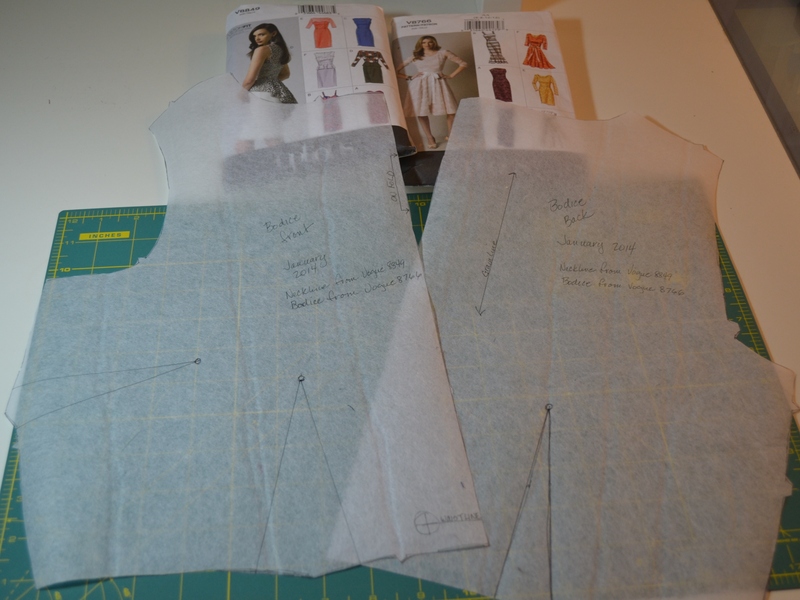 Only one muslin needed and I traced the pattern for the new bodice because I just may end up using it again. The dresses are very different. 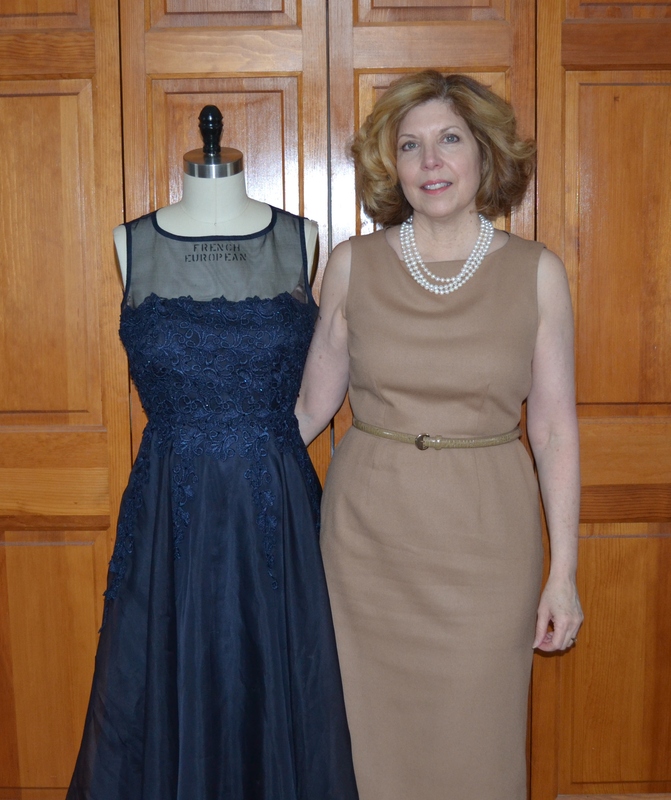 The first was multiple layers of silk and lace, made for a formal charity event, which I wrote about last week. 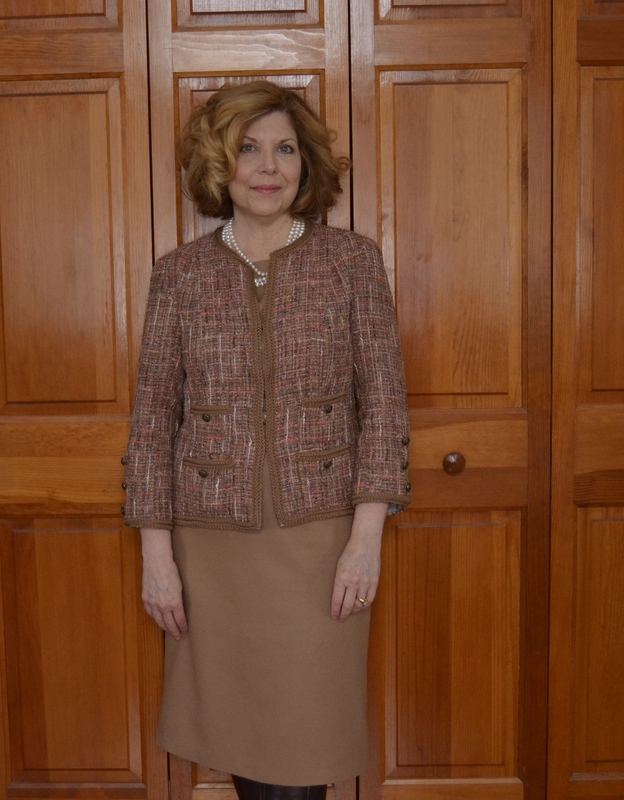 I liked the neckline and bodice so much, I decided use it for a simple wool dress to go with my Little French Jacket. The skirt is from 8849 and the same as the strapless under dress from the gown, just shorter. 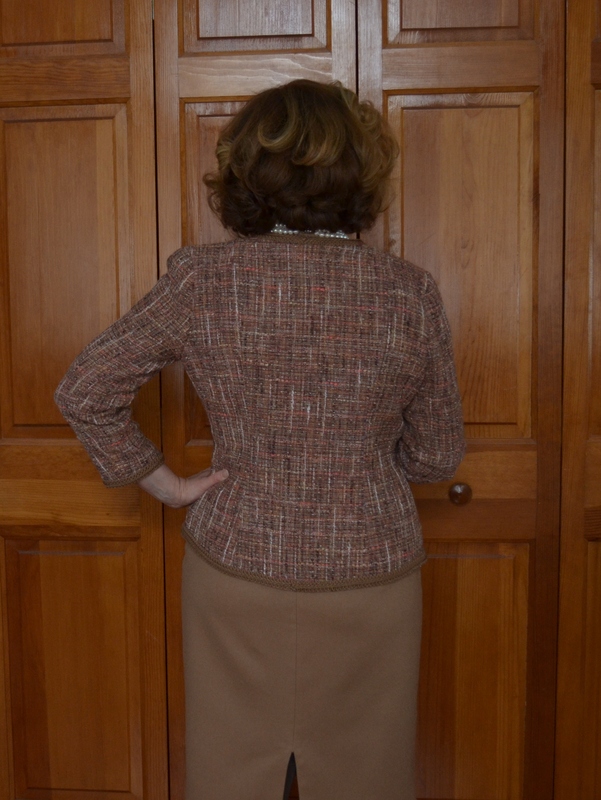 I also had to move the skirt darts in the back to match up with the lower back bodice darts from 8766. The camel wool was in my stash and I underlined it with silk organza, then lined it with Bemberg rayon. It’s not likely I ‘ll wear it without a jacket or sweater in the frigid winter we are having, but it feels great under the LFJ. On a normal day it would be quite comfortable, but when I wore it to work last week, I added a long sleeve t-shirt (which didn’t show) because the wind chill was about 20 below. Our office is always cold, but the combination of tights, boots, t-shirt, wool dress and quilted jacket was pretty cozy. You look wonderful! Great job on the dress. It does go really well with your jacket. 🙂 Our office is always freezing too. Tissue weight jersey is new favorite first layer. Thanks, today I had on so many layers I felt like the Michelin Man, drove to work and found out the college was closed due to the cold. That will teach me to pay more attention to the news. 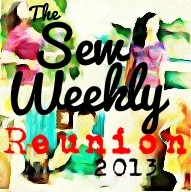 Thank you, I’m learning so much from all the blogs, sew-a-longs and online classes available. I know they are such a great asset to sewing aren’t they! ? It means you can have a go at anything! I am hoping for an Anna Dress pattern-By Hand , London for my birthday as have seen so many beautiful ones on the web! I also keep seeing The Bombshell costume and sew along…..have you ever sewn swim wear? I sewed some bikinis as in my teens, but mostly from cottons. I grew up on a lake and we lived in our swim suits. I even posted one old photo, with an embarrassing leopard skin print bikini on my blog. 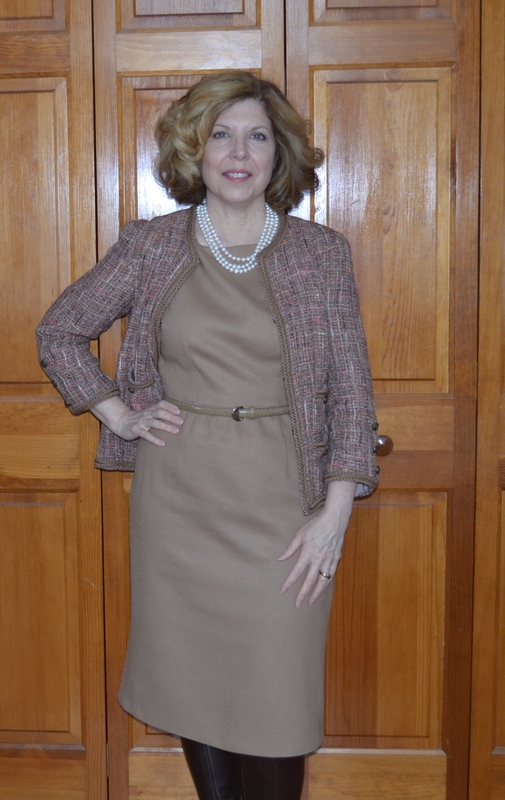 I remember my mother having a suit that looked very much like the bombshell style. It was a dusty apricot color with cream piping and straps, very feminine. Perfect dress that will work by itself and with your gorgeous jacket, love the colour. Thanks, hope your Marfy blouse is going well. I’m skipping the blouse, but may try to do the skirt and jacket.